Once upon a time sweet, little cakes covered in thick frosting and sprinkles made their way out of the oven and into our hearts . Uncomplicated, portable and portion-controlled there is a certain satisfaction one feels when peeling the pleated paper liner off of a cupcake before taking the first bite. Cupcakes have been steadily growing in popularity. Some would say they’ve evolved into a culinary cultural phenomenon. What started as a mini-treat now ranges from your standard chocolate/vanilla variety to exotic flavors, fillings and toppings that stretch both the imagination and the palate. Since many of our customers are part of this community of bakers we thought we’d aide you in the effort by providing some exceptional options to package and present your creations. We have added an outstanding assortment of BOXit Bakery Supplies which practically guarantee your cupcakes will be noticed before they’ve been unwrapped. 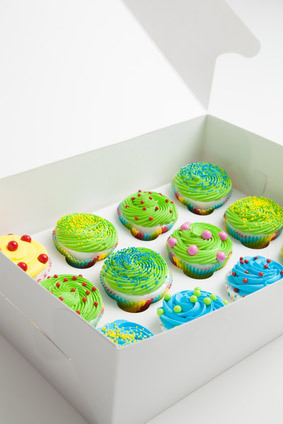 Boxes come in a range of sizes, shapes and colors -but so do cupcakes. Under the cover (with or without a window) Carmel Macchiato,Strawberry Lime,Dark Chocolate-Bacon ,Pink Salt and Pepper will coexist while keeping their individuality thanks to box inserts. Single, double, four,six,or a dozen, mini, regular or jumbo there is the right fix for the right box. Color selections include classical White, perky Pink,earthy Kraft, and congenial Cocoa. You may now focus on the art of baking.